Your 2-month-old baby averages approximately 13 hours of sleep and dozing time during a 24-hour period, according to KidsHealth, but your baby needs more than sleep during this important period of development. Children at this age typically sleep for 4 to 5 hours and then wake up for food, but this waking period also offers a time to stimulate your baby's emotional, intellectual and physical growth. The time also allows you to guide your child to develop early social skills. 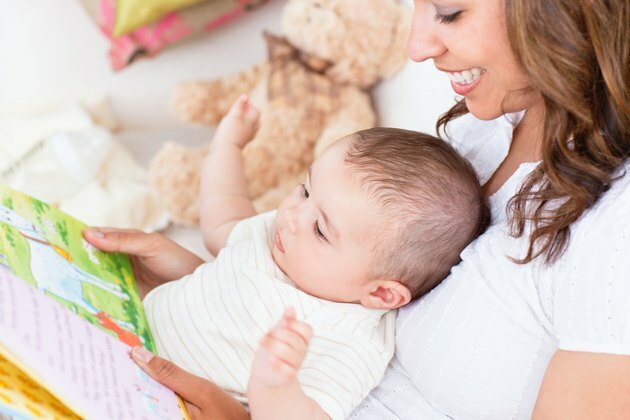 Pediatrician Jamie Loehr, M.D., recommends sitting with your baby and showing him images in picture books. Select books with simple images with contrasting bright colors. Talk to your baby throughout the day. Encourage your child to interact with his environment by hanging a toy above his crib or play area. Use an unbreakable mirror in play to let your baby see his image. Select toys for your child that use different sounds and noises to help build his curiosity. Give your 2-month-old tummy time several times a day. The March of Dimes encourages parents to turn a baby onto his tummy and prop his head to avoid suffocation. Tummy time develops the muscles in your child's neck, arms and shoulders. Choose hanging toys for the crib or playpen that feature colorful pieces that move to attract your child's interest. Interesting toys encourage your baby to physically reach out for the toys -- this action tones muscles and helps him develop smooth movements. Smile for your baby and encourage him to smile back when he coos. Model exaggerated facial expressions to show surprise or delight and and give your child a huge smile to show your pleasure when good things happen. Your happy face demonstrates to your baby how to use facial expressions in similar situations. 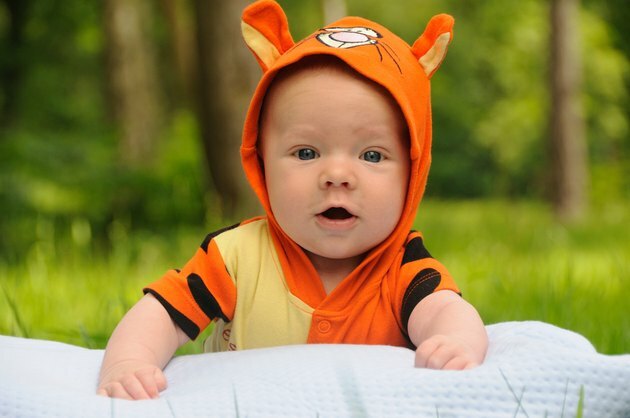 Give your 2-month-old lots of hugs to show your love as well as to demonstrate how to show affection. The National Center for Infants, Toddlers, and Families tells parents that it's impossible to spoil a 2-month-old by giving too much affection. Speak to your baby in soothing tones frequently during waking periods, and introduce him to guests visiting your house. Take baby to visit relatives and friends, but select calm places where your baby won't be alarmed by loud or sudden noises. Encourage your child to hold your finger and give your child a soft back and leg rub to relax. Massage helps your child to learn to control emotions and gives parents and baby a time to bond and connect, according to the Oregon Health and Science University Center for Women's Health. The health center recommends massage as a way for parents to learn to read baby's needs and special cues that signal problems or discomfort.